–Mobile kitchens are taking the nation by storm as busy consumers look for unique, healthy, and quick dining options on the go. In a recent report released by California Mobile Kitchens, the dangers of unsanitary practices are addressed. 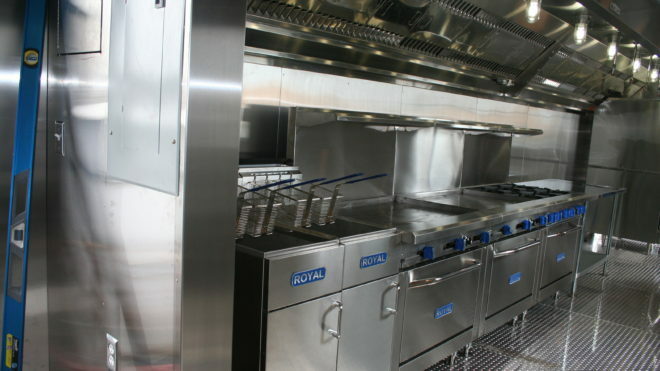 The mobile kitchen experts at California Mobile Kitchens recommend that stringent cleaning and storing procedures be implemented in mobile kitchens. It is the responsibility of mobile kitchen renters to create cleaning protocols and follow up with mobile kitchen staff to ensure they are complying with cleaning best practices to prevent the likelihood of foodborne illness. Clean all day, throughout the day. Mobile kitchen operators can often experience lunch and dinner crowds like no other, often leaving no time to clean prepping counters, stove tops, and grilling surfaces between orders. All cooking surfaces should be cleaned every cooking shift. This includes brushing the grill between cooking poultry, fish, and red meat as well as switching cutting boards and empty trash at least once every two hours. Don’t forget the same appliances. Can openers, coolers, and even unused (but exposed) utensils should be washed after every shift. Even if the utensil was not used, if it was left near or around raw meats, they should be sanitized before using. Can openers are small vacuums of food particles and bacteria. Having several of each small appliance is advised to allow for proper cleaning and drying of used utensils. For more mobile kitchen advice or to inquire about renting a mobile kitchen, contact the mobile kitchen experts at California Mobile Kitchens at (805) 434-6172.